The Global Volcanism Program has no activity reports for Isanotski. The Global Volcanism Program has no Weekly Reports available for Isanotski. The Global Volcanism Program has no Bulletin Reports available for Isanotski. Rugged pinnacles form the summit of the deeply eroded Isanotski stratovolcano, locally known as Ragged Jack, at the center of a group of three volcanoes on eastern Unimak Island. Four poorly documented historical eruptions were noted in the 18th and 19th centuries. However, Miller et al. (1998) considered that some or all of these eruptions could have been from neighboring Shishaldin and that historical eruptions must be considered unlikely, given the extreme degree of erosional dissection. There is no Deformation History data available for Isanotski. There is no Emissions History data available for Isanotski. Three prominent volcanoes are constructed along an E-W line on the eastern half of Unimak Island. The aptly named Roundtop volcano in the lower foreground is glacially eroded and has had no historical eruptive activity. In the 1930s warm springs were found on its slopes. The recent discovery of Holocene pyroclastic-flow deposits and a group of lava domes south of Roundtop indicate it is still an active volcano. The glacially dissected Isanotski volcano and the beautifully symmetrical Shishaldin volcano are the prominent peaks behind Roundtop. Photo by Clayton and Marcia Brown, 1986 (courtesy of John Reeder, Alaska Div. Geology Geophysical Surveys). Three prominent stratovolcanoes are constructed along an E-W line on Unimak Island. Steaming Shishaldin, the highest of the three, rises to 2857 m in the foreground and is one of the most active volcanoes in the Aleutians. 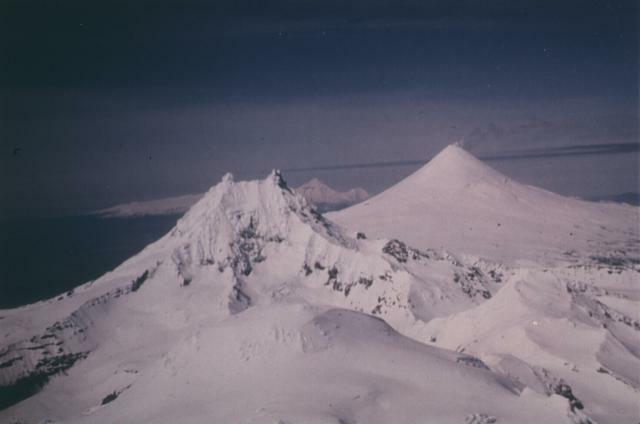 The dissected Isanotski volcano (right) has had reported eruptions of uncertain validity, and Roundtop volcano (center distance) has had Holocene eruptions, but no historical activity. Photo by Clayton and Marcia Brown, 1987 (courtesy of John Reeder, Alaska Div. Geology & Geophysical Surveys). 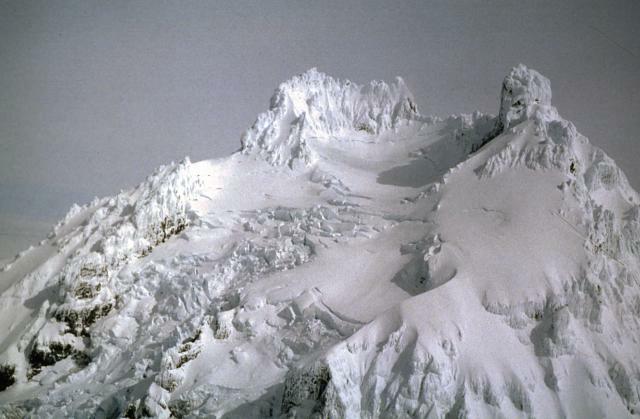 Glaciers drape the ruggedly dissected upper flanks of Isanotski volcano and its dramatic summit pinnacles. Isanotski, locally known as Ragged Jack, is at the center of an E-W-trending group of three volcanoes on Unimak Island. Four poorly documented historical eruptions were noted in the 18th and 19th centuries. Some or all of these eruptions, however, could have been from neighboring Shishaldin volcano, and historical eruptions of Isanotski must be considered unlikely, given the extreme degree of erosional dissection. 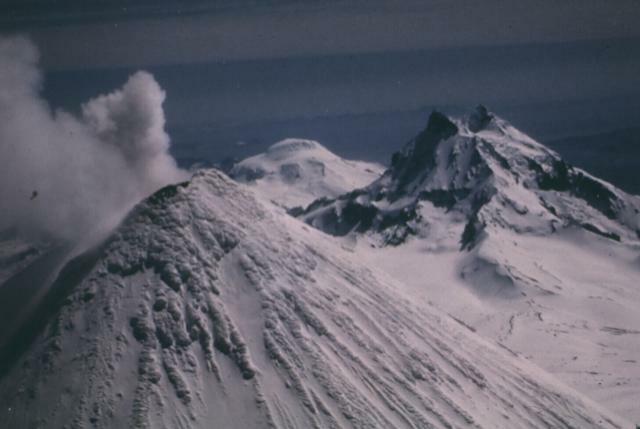 Photo courtesy of Alaska Volcano Observatory, 1994. There are no samples for Isanotski in the Smithsonian's NMNH Department of Mineral Sciences Rock and Ore collection. IRIS seismic stations/networks Incorporated Research Institutions for Seismology (IRIS) Data Services map showing the location of seismic stations from all available networks (permanent or temporary) within a radius of 0.18° (about 20 km at mid-latitudes) from the given location of Isanotski. Users can customize a variety of filters and options in the left panel. Note that if there are no stations are known the map will default to show the entire world with a "No data matched request" error notice. Large Eruptions of Isanotski Information about large Quaternary eruptions (VEI >= 4) is cataloged in the Large Magnitude Explosive Volcanic Eruptions (LaMEVE) database of the Volcano Global Risk Identification and Analysis Project (VOGRIPA).